Today I had lots of time to think as we walked. Jules was trailing behind because of his blisters and achy feet. We tried to stop every two hours so he could give his feet some rest. Since both of us ate very little of our unappetizing breakfast, we stopped at a small cafe and had toast with honey and iced coffees. The owner was an older lady, and her customers were other older ladies who live nearby and come every day to share stories and spend time with friends. Later we stopped again in another small cafe and had a lunch of Yaki-Udon noodles pan-fried with vegetables. We also stopped in some shaded rest areas, just to sit for a few moments and rest. The day began cloudy, but it had cleared up and became sunny and warm. For much of the day, we walked along a busy road which snaked into the mountains. When Jules was feeling strong, we veered into some small villages and took the more rural, empty roads, but they do tend to meander in twists and turns, and it added many kilometers to our day. By the time we got to Kanjizaiji Temple, Jules was barely able to walk. But he was a real trooper and we got all of our prayers, chanting and stamping done and continued walking through the charming town, to our hotel. In the hotel, we requested a Japanese style room. It was a smart choice since the hotel is a bit worn out, and our Japanese style room is quiet and lovely. Both Jules and I were so tired after walking today for 31 kilometers, that we did not notice that instead of putting laundry detergent into the washing machine, we poured in toilet cleaner. I discovered our error when I went to put the laundry into the drier. Luckily it contained no bleach, and I returned the laundry to the washing machine and washed it all over again with lots of water and laundry detergent. WIFi Internet was only available in the lobby area, but hundreds of kids were having a dinner party on the first floor. They were running and screaming, having a great time, which made it impossible for us to enjoy the lobby. At least we were served dinner in a private room away from the main dining hall. We were served mushroom rice, fish Katsu, Sashimi, pickles, Chawang baked egg custard with herbs, mushrooms and shrimp, a dish of a boiled fish head, a Yuba roll with sashimi in vinegar, a small salad, and a tiny slice of melon. Jules was asleep moments after we got back to our room. I had to stay awake to attend to the laundry. 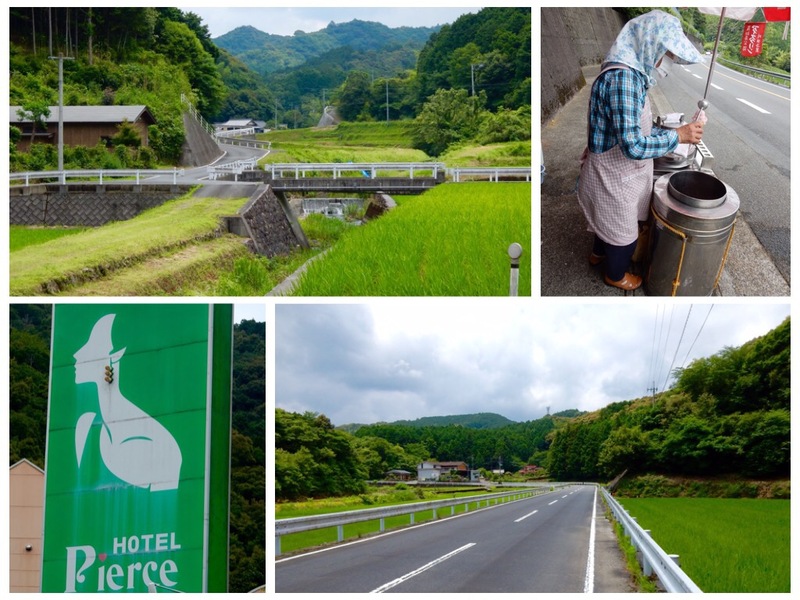 Here is some of what I thought about as we left Kochi Prefecture, the realm of asceticism and discipline, and entered Ehime prefecture, the realm of Enlightenment. I thought about how much of our suffering is a result of having preferences and aversions to things and to circumstances. We much prefer to walk without our heavy backpacks. We prefer not to have rain pouring on us as we walk, but to have a dry day. We prefer a cloudy and cool day to a very sunny and hot day. We prefer to eat fruit and vegetables, instead of eating fish heads or eggs, etc. This means that when conditions do not meet our preferences, we feel sad, resentful, upset, disappointed, etc. Sometimes, the feelings we have are stronger than simply preferences, we have aversions to things and circumstances. I abhor staying in dirty places with bedbugs. I do not like to stay in smoky, noisy and neglected places. I have an aversion for rudeness, for violence, for inconsiderate behavior, etc. This means that when I encounter those things, I react not based on what actually happens, but based on my preprogrammed aversions. Having a self that comes preprogrammed (by me and by my preferences), is like carrying with me an old and sometimes outmoded self. Having a self that I carry with me from day to day, is like clutter. I basically carry around all of my past perceptions, ideas, memories and past selves, books I’ve read and ideas I’ve embraced. To be filled with light, I really have to try to have less clutter…. Less self… Not to carry around all of my old selves from day to day. Having a self, is like the “straw dog” that is mentioned in the ancient Tao. Straw dogs were ceremonial items. In ancient China, where life revolved around farming, people celebrated the agricultural seasons with prayers and offerings. They celebrated the harvest, the planting season, the rainy season which brought water to their fields, etc. One of the most famous ceremonies was the making of dogs from straw, and later burning them in the fire as an offering. If you know that it is not a real dog, but one made of straw, why be upset over it’s being burned? So it is with human bodies and forms. There is only Mind in the Universe. Only LIGHT in the Universe, which we shape into many human forms. Each incarnation, we shape the Light into another form. Those images are images that we have made from the matter that is readily available in the Universe. You ARE ETERNAL and immortal. That is to say that the essence of YOU, was never born and shall never die. You exist beyond the idea of time and space, and you will always be unchanged forever. But the lifetime in which you made a straw dog named Tali or John will not last forever. Heaven and Earth, God, the Great Tao, Life, knows nothing of the temporary dreams of the eternal children of Life. These forms we take, are just dreams that we dream. What is eternal cannot die nor change. You are an eternal Mind that creates all forms, lifetime after lifetime after lifetime…..
As I walked thinking about all this, I saw a hawk chase and catch a tiny bird in its claws. It then flew to its nest. I stood there tired, waiting for Jules who was limping behind, to catch up with me. I had no preferences nor aversion to the killing scene I just witnessed. Should I feel sad for the tiny bird who is the victim in this scene? Or should I feel for the mother Hawk, who was getting food to feed her babies? Nor was I sad to see the Hawk catch the small bird. I was a witness, letting life take its course, without my interference or judgement. They are all like straw dogs…. How silly it is to cry over something that cannot die….